Our metal chart was in need of a big shake-up, which is exactly what it had! We removed some older models such as the Gibson SG 2016 and Ibanez S5570Q, and added a couple of excellent metal guitars. Two awesome signature models top the chart – ESP’s James Hetfield Signature Snakebyte and Dean’s MAB1 Speed of Light – while other additions include the Schecter Synyster Gates Custom, the Dean Dave Mustaine Zero ‘In Deth We Trust’, and Squier’s brand new for 2018 Contemporary Active Stratocaster. Metal is a broad term, covering everything from thrash metal and neoclassical, to death metal and metalcore. It’s a word that conjures up images of aggressive tones, fast tempos, blistering solos and extroverted styles. 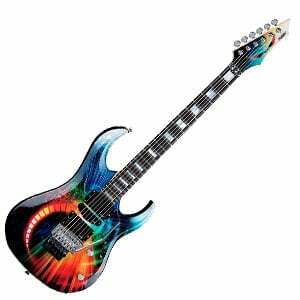 However, defining the best electric guitar for metal is a pretty difficult task, as we all have different preferred subgenres and different budgets. To help, we’ve sifted the market in an attempt to find the best guitars for metal – all are six-stringed beasts from different metal-focused brands, covering a range of budgets. Be sure to stick around after the chart for some additional help in choosing your axe. A savage premium model from the Metallica front man. One of the finest metal guitars around, courtesy of MAB! The vibrant alder proved to be the winning factor. Bonafide pro-level heavy metal sound. A vibrant and versatile shred machine. Signature Synyster Gates model from Schecter, offering huge style, tone, and attitude. Sleek and stylish metal guitar from Ibanez’s Iron Label collection. A powerful midrange axe as black as winter. A rebellious modern Strat made for heavy rock and metal. Cool sound and an affordable price tag. We have singled out a set of ten champions worthy of your time, as well as a few general guidelines on what to look out for in the metal market. Check it all out below! The first of two Metallica signature guitars on this list is James Hetfield’s signature Snakebyte from ESP – and it absolutely rocks. The reason it rocks is largely down to the fact that it was all designed by Hetfield himself, with a supercharged style that will certainly turn a few heads. It features an Explorer-influenced solid mahogany body with an awesome U-shaped mahogany set neck. It’s loaded with the custom JH ‘Het Set’ – that’s EMG 60 and 81 active humbuckers, for a super-aggressive voice. The rest of the hardware on this premium model is very high-end. Ultimately, it’s a guitar built for stage performances. The only question now is: can I afford it? Check out more on the Signature Snakebyte in the full review. Michael Angelo Batio – a god when it comes to metal guitar! So, it’s no wonder that one of his most popular signature guitars – the MAB1 from Dean – is such a killer axe. The gorgeous Speed of Light graphic really brings this guitar to life, although it actually falls a close second to the playability, which has been made to specifications set out by MAB himself. It features a bolt-on maple neck that has a very thin profile, along with 24 jumbo frets on the ebony fretboard. As for a voice, it’s very powerful and equally articulate, with good versatility thanks to the trio of EMG pickups (two humbuckers and a single-coil). There’s more on this stunning metal guitar in the complete MAB1 round-up. Signature guitars from renowned guitarists are a bit of an iffy ground for most musicians. On one hand, they absolutely deliver the sound of the given musician, but on the other hand, the question arises of how good will they serve you and how good they will match your style. And in our humble opinion, ESP’s signature model from Metallica guitar titan Kirk Hammett is a great choice and an option you can’t go wrong with. Yes, it will cost you a pretty penny, but it will deliver an amazing sonic crunch you can adapt to your personal needs while always retaining a top-notch sonic foundation. It may have Kirk’s name on it, but this thing can tackle any style of metal any day. We are looking at a combination of a high-end alder body and maple neck with rosewood fingerboard. The body is very resonant and the vibrant alder proved to be one of the winning factors for this instrument. Other notable features include a 25.5-inch scale, a set of 24 frets, active EMG pickups, and an included case. Pinking things up a notch, the Hellraiser C-1 from Schecter is one of the cheapest options if you want a bonafide pro-level heavy metal sound.Apart from the classy finish, one of the things that instantly stand out about this guitar is a top-level pair of 81TW/89 pickups from EMG. Additionally, the fact that the manufacturer threw in high-end mahogany and neck into the mix and spiced it up with top-level electronics is nothing short of amazing for this price tag. Like we said, if this was a Gibson, the price would be $2,000! Needless to say, everything about the instrument screams metal, and not just in the aesthetic department. The pickups are a great mixture of gain-fueled fuzz and naturally heavy sound without artificial components, while the mahogany’s organic sound – which is full, deep, with strong low ends, but enough mellow end to secure audio dynamics – fits the bill perfectly. 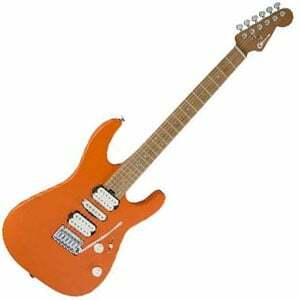 Here we have a simple but gorgeous superstrat-style guitar from the Californian brand Charvel. Available in an awesome satin Crushed Orange or Army Drab finish, this midrange axe shows off a few higher-end features that metalheads will love. The caramelized maple neck is very ergonomic, with a sleek satin finish and rolled fretboard edges. The hardware is equally impressive, with a trio of pickups from Seymour Duncan, including a Full Shred SH-10B at the bridge and a Custom Flat Strat SSL-6 single-coil in the middle. The tone is warm, aggressive and clear, although versatile enough to allow you to enjoy more bluesy tones alongside your metal. You can read more on this solid Pro-Mod DK24 in the full review. You don’t have to be a diehard fan of Avenged Sevenfold to appreciate this heavy metal beast from Schecter – the signature model of lead guitarist Synyster Gates. Anyone who wants an extroverted menacing look and a powerful metal tone can appreciate this awesome axe. A real unique piece, this double-cutaway guitar shows off a distinctive style with an uber-cool pinstripe paintjob and stunning playability on the C-shaped mahogany neck. Giving this metal monster its heavy tone is a pair of overwound passive Seymour Duncan Invader humbuckers – a TB-8 (bridge) and SH-8N (neck). Throw in a Floyd Rose 1000 Series Tremolo bridge, locking nut and responsive Grover tuners, and this is one smart choice – as we mention in the full review. Ibanez’s popular Iron Label collection features the tagline ‘Metal to the Core’, which is exactly what this Iron Label SIX6FDFM delivers. It features a super-comfortable and lightweight S Series body with a mahogany/maple build. The bolt-on neck is great fun to play, with the Japanese brand’s low-profile Nitro Wizard design and a 24-fret fretboard. It looks great too, with the cool Blue Space Burst finish and edgy reverse headstock design. In the main review of the Ibanez SIX6FDFM we discuss the electronics in more details, yet be aware that it’s fitted with two unique DiMarzio Fusion Edge humbuckers for a hot and punchy, but surprisingly warm tone that works for all metal styles! For a guitar to take the title of the darkest on a list of guitars for metal, you know it must be pretty damn dark! The EC-Black Metal from ESP LTD does not disappoint. The guys at LTD went overboard (in a good way) with the black markers when designing this midrange guitar. With the comfortable Eclipse single-cutaway shape, it sports a satin black finish across the solid mahogany body and neck, with no decoration. Hardware is equally as simple, with a single Seymour Duncan ‘Blackened’ Black Winter humbucker at the bridge position, with just one control knob. However – as we elaborate on in the main EC-Black Metal review – the tone delivers a great deal for the darkest styles. New for 2018 – and new to this chart – is the rebellious Contemporary Active Stratocaster from Fender subsidiary Squier. Part of the brand’s new Contemporary Series, the Active Stratocaster uses the tried-and-tested Strat body with a host of changes that make it a serious metal performer. Most notably is the inclusion of two Squier Active Humbuckers to deliver a powerful but articulate metal tone, as well as a licensed Floyd Rose tremolo and locking nut that can cope with heavy playing. On that note, the slightly flatter 12” fretboard radius makes shredding easier, while the C-shaped satin-finished maple neck shows off typical Fender/Squier playability. A real winner and a worthy contender for your cash – as we highlight in the complete Contemporary Active Stratocaster review. If you’re into the vibe of classic Metallica stuff or Children of Bodom, a Randy Rhoads model from Jackson is the thing for you! 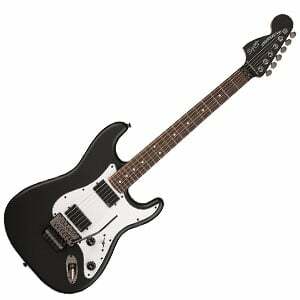 The specific axe we have in mind, which offers both a cool sound and an affordable price tag – is the JS32 model. The guitar is oriented towards the staple brand of heavy metal, meaning a more balanced sound, less chug and more crunch. The tone is best described as syrupy, as it flows very well into any sonic mix, especially when playing lead guitar lines and licks. The guitar utilizes a basswood body, which is a low-cost option that was combined with a set of humbucker Jackson high output pickups with ceramic magnets. This mix genuinely surprised us and we couldn’t be more satisfied with the tone, especially for the listed price! Other notable features include a bolt-on maple neck adapted for fast playing, a rosewood fingerboard with 24 frets and col shark fin inlays, a three-way toggle switch, elegant black hardware, as well as the company’s signature double locking tremolo bridge. The spikey looks, of course, are classic Jackson! As exciting as it is to buy a new guitar, there are some important things to consider when buying one specifically for a demanding genre such as hard rock and metal. Let’s check them out. Design: Everyone is different and style is perhaps the most personal aspects of a guitar. You may be an extrovert and want some insane design from a brand like Dean. Or you may prefer the subtler approach and a more refined look, with Schecter always impressing in this area. Just choose something you are comfortable with. Pickups: It goes without saying that you’ll want humbuckers on your guitar, as these offer the thick, beefy and articulate sounds that metal music is built upon. If you’re into powerful high gain, which retains its clarity at huge volumes, active pickups are a worthwhile choice, especially for lead players. Otherwise passive humbuckers can really impress in all volume ranges and sound a little more organic than their active counterparts. Tonewood:At the higher volumes and with the gain cranked up, the tonewood doesn’t really make too much difference to the sound, but – if you have the choice – go with mahogany, which is strong, deep, resonant and rich. Cheaper models may use poplar or basswood, which is punchy, powerful and lightweight, and a good compromise. Neck:Most necks in this metal-focused market will already be taken care of – they’ll be fast and thin, and easy to play. If you have an option, a thin U shape and a satin finish is always a great combo, especially for shredders! Electronics: While solid controls including volume and tone pots are always essential, some things like phase switching, advanced EQ adjustments, kill switches and coil tapping are always welcome options in this genre. Bridge: This comes down to personal preference. If you love making huge divebombs or even just the occasional vibrato to spice up a solo, go with a tremolo bridge – whether a genuine or licensed Floyd Rose. If this isn’t necessary for your style of play, a fixed bridge will usually offer you more tuning stability and sustain, and an easier route when changing your strings! Extended Range: If you love darker, heavier sub-genres of metal, it’s well worth considering a 7-string or an 8-string guitar, which can open your eyes and ears to a completely different tone. With that, our little journey in metal guitars comes to an end. We hope you enjoyed the ride and found some inspiration from our chart and quick guide. Don’t rush your decision – especially if you are spending big on a guitar. Read some reviews, watch some videos and have a good browse of the market, before settling on something amazing. 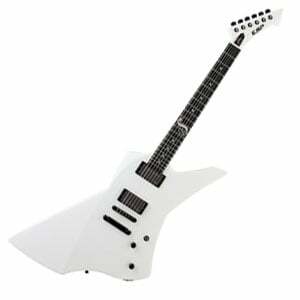 Good luck with the hunt for your ideal metal guitar! Apparently the Schecter has some issues with volume knob placement. Is this a big problem or can you get by it? what about any of the Ibanez Iron Labels? I’ve been wanting the Rgib6 for metal, and i dont know a lot about it.